Essentra Specialty Tapes, a premier adhesive tape supplier, will display its extensive line of specialty adhesive tape products at GlobalShop 2016, the premier event for the retail design and shopper marketing industry. Essentra Specialty Tapes will feature its products for use in designing and manufacturing P.O.P. displays, signage and other merchandising displays. Free tape samples will be available to all booth visitors. Duraco® Red – This double-sided film tape features a clear tape with a transparent red liner, and a strong permanent adhesive for hard-to-stick applications, such as UV-coated materials or in high service temperature environments. Remo Two® Clear - Remo Two Clear is a double-sided clear foam tape with a removable acrylic-based adhesive on both sides, which removes cleanly from metal, wood, glass, and plastics. Remo Two is ideal for applications where the tape should not be visible on the display or sign. Duraco® Hook and Loop – These popular fasteners are two-part tape closures with permanent adhesive coated on the back of each closure side. The hook and loop sections are designed to fasten and unfasten repeatedly - up to 5,000 times. 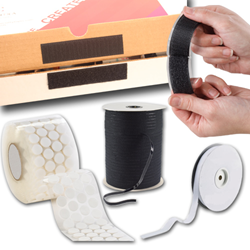 Finger Lift Tapes - These user-friendly tapes feature a release liner with a dry edge on each side of the tape. The liner extends beyond the width of the adhesive strip, allowing the liner to be removed more quickly and easily. This finger lift tape feature is offered in the Essentra tissue, transfer, film and bag sealing tape families. Duraco® Magnetic Tape – Flexible magnetic material is coated with an acrylic-based adhesive on one side. Indoor, outdoor and matched pole tape versions are available, along with non-magnetized receptive steel sheets (on rolls) designed to attract magnets. Essentra Specialty Tapes will also feature its popular double-sided core products, including the following unique tape product lines. While all product samples will be available, Remo tapes will be demonstrated at the booth. Twin Stick® - The P.O.P. industry’s most popular tape, due to its quick stick qualities and strong holding power, is a double sided foam tape which features a permanent adhesive on both sides; it is available in many sizes, in pieces and coins. Remo One/Two® - The Remo One family of double-sided foam tapes has a permanent adhesive on one side and a removable adhesive on the other. Remo Two tapes provide a removable adhesive on both sides. Both Remo tapes are available in many sizes, in pieces, coins or rolls. Dubl Kote® - This line of double-sided foam tape is ideal for flexible and conformable requirements, such as joining irregular surfaces. It features a permanent adhesive with a strong bond on both sides. Dubl Kote® tapes are available in rolls in a variety of thicknesses, widths and lengths. Duraco® Metal Shelf Tape – This strong double-sided adhesive foam tape can be removed from surfaces such as metal, plastic and glass without leaving residue. Duraco® High Bond – This double-sided tape has been designed for high stress applications where a strong permanent bond is desired. Available in a variety of thicknesses and colors, Duraco High Bond can replace metal fasteners and has an optically clear line for glass and plastic applications. Essentra’s booth will also represent other parts of the Essentra plc organization, such as Essentra Component Solutions, Health and Personal Care Packaging and Filtration Products. Visit Essentra Specialty Tapes at GlobalShop 2016, Booth #4758. Detailed information about Essentra Specialty Tapes and its products can be found at: http://www.essentraspecialtytapes.com. GlobalShop will be held at the Mandalay Bay in Las Vegas, from March 23 to March 25, 2016. Retail buyers make GlobalShop their priority destination each year because of the sheer scope of products and services available to the retail industry market. Whether they are looking for store display fixtures, visual merchandising, digital solutions, in-store marketing or more...it’s all available in one of the five GlobalShop pavilions - see more at: http://www.globalshop.org/index.shtml.